Excited to share this sweet engagement session today at one of my favorite locations near Valencia, CA! Lexa & Eric met while in college and it was actually while Eric’s good friend was dating her. They didn’t really dive into a friendship until later when Lexa was single and they ended up working on the same outreach team together. They soon realized they kinda liked each other more than just a little. They ended up dating and this last December Eric proposed and she said yes! During their session I loved that it was easy to laugh with them and just talk about life and future plans. They both have a heart to serve God with their lives and I know He is going to use them in a mighty way. So happy for you two and loved photographing your engagement session!! Congrats! Hillarie and Lance are high school sweethearts and grew up together being best friends. They were so young when they first met that they can’t actually remember it but Hillarie remembers thinking as a little girl that one day she would marry that boy named Lance. 🙂 For the proposal Lance had it all planned out and Hillarie had no idea what was going on. He planned a day for her and her friends to go to Disneyland but the whole time Hillarie thought it was an early 21st birthday gift for her and her friends from their parents. She and her friends had a fun morning and that afternoon had stopped in front of the castle to take pictures. At just the right time Hillarie turned around and Lance was standing there, then he took her hands and got down on one knee to propose. She was in shock! When he took the ring out of his pocket, that’s when Hillarie began to cry. He asked her to marry him and she nodded yes! A crowd had surrounded them during this time and began to clap and cheer for them with photographers snapping away at this big moment in front of Sleeping Beauty’s castle! I loved photographing the love between these two during their engagement session and couldn’t be more happy for the two of them. We had fun coming up with things to do and since Lance had taken a photography class he would sometimes comment on why he knew I had picked a location for the lighting or composition. One of my favorite things about their session was just how evident it was that they were so happy just being together. I know God will use these two in ways they never imagined and I can’t wait to photograph their wedding in June! As a wedding photographer here in Valencia I love that it has so many pretty areas tucked away around the entire city. Makes is easy to find lovely backdrops for taking photos. For Tara and Trevor’s engagement session we headed off to walk around the paseos near one of the bridges. One thing I love about Tara and Trevor is how much they laugh with each other. During their session they had little laughing fits here and there and it was so fun to photograph and be around them. I’m excited for their wedding next year and am sure we’ll have some good laughs then too! Congrats you two on your engagement! 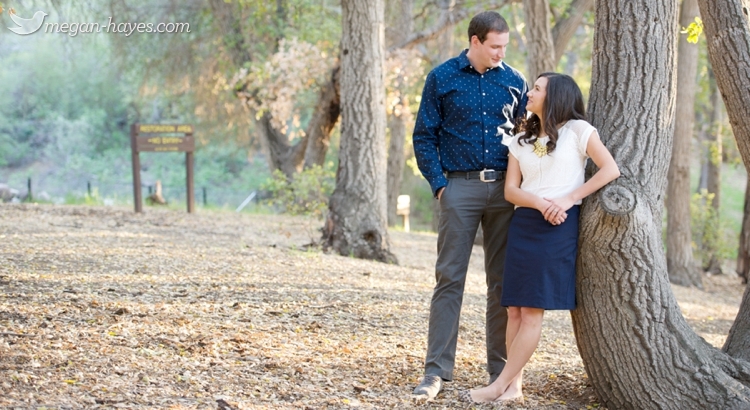 Just a little peek at Lauren and Joy’e rustic engagement session today in Santa Clarita!